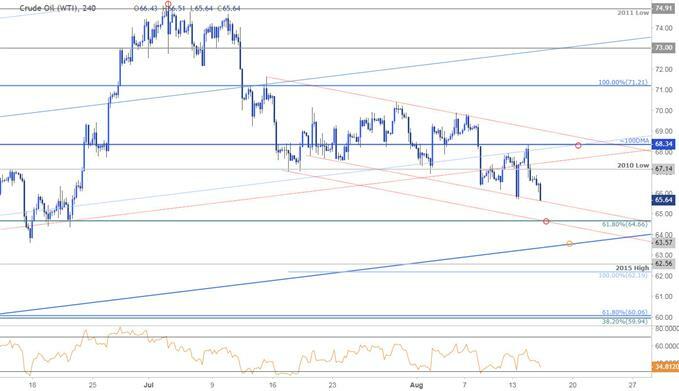 Crude oil prices have plummeted nearly 14% off the July highs with the decline now approaching broader up-trend support. Here are the updated targets and invalidation levels that matter on the Crude Oil charts. Review this week’s Strategy Webinar for an in-depth breakdown of this setup and more. Technical Outlook: In last week’s Technical Perspective on Crude Oil we noted that price had, “broken below parallel support with downside weekly support targets unchanged at 66 and the June close-low / pitchfork support at 64.27.” Crude is breaking to fresh monthly lows today with price approaching areas of near-term support. 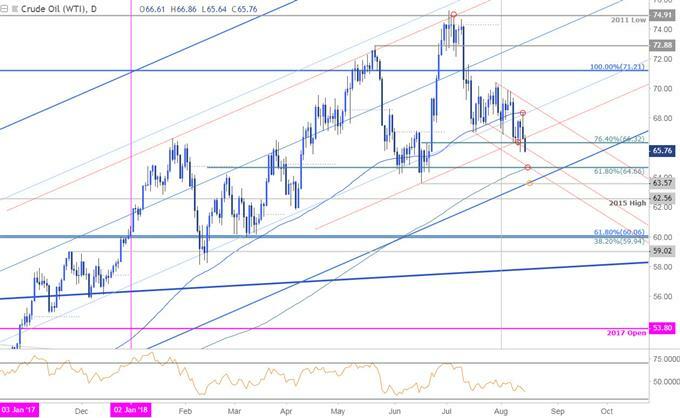 Daily confluence support rests at 64.55/66 where the 61.8% retracement of the yearly range converges on the 200-day moving average and down-slope support. Broader structural support rests at the lower parallel (blue) / June lows at 63.57- We’re looking for a reaction / possible exhaustion off one of these levels. Notes: A closer look at crude price action further highlights the upcoming confluence support targets. Initial resistance stands at 67.14 with bearish invalidation now lowered to 68.34. Ultimately a break below 62.19/56 would be needed to suggest a more significant long-term high is in place with such a scenario targeting confluence Fibonacci support at 59.94-60.06. Bottom line: The immediate threat remains lower but we’re looking for a reaction at upcoming support targets. From a trading standpoint, look to reduce short exposure into these targets – IF the broader up-trend in crude is going to hold, price will need to find support at these levels and we’ll be on the lookout for possible exhaustion / long-entries. That said, we’ll respect a downside break / daily close below. 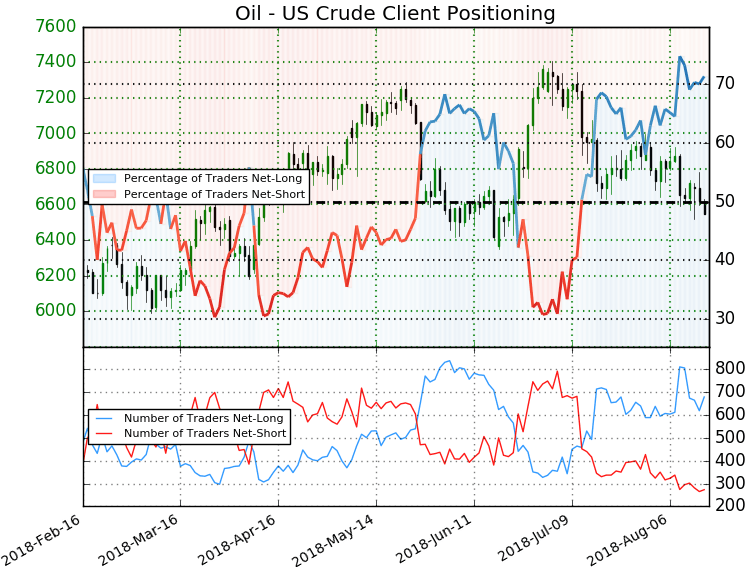 We typically take a contrarian view to crowd sentiment, and the fact traders are net-long suggests crude prices may continue to fall. 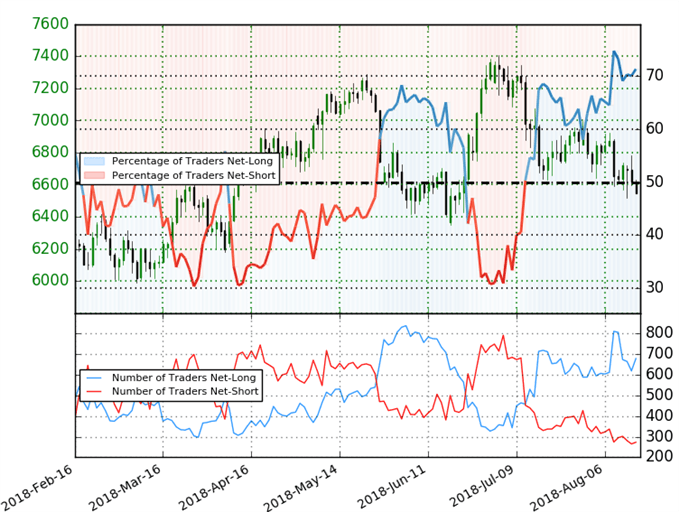 Traders are less net-long than yesterday but more net-long from last week. The combination of current positioning and recent changes gives us a further mixed Crude Oil trading bias from a sentiment standpoint.